Create a treasured network of support for courageous children by showing your commitment in finding a cure. 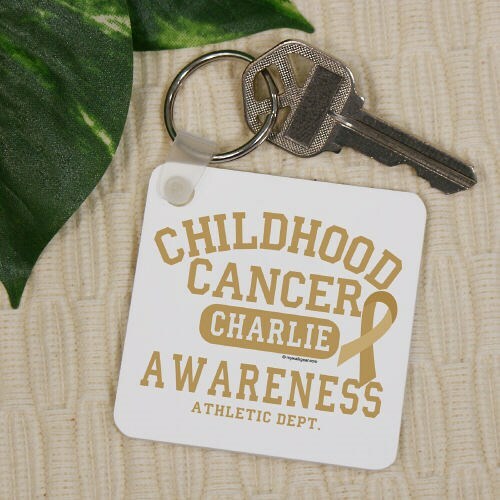 Show that you support Childhood Cancer Awareness with this Personalized Childhood Cancer Awareness Key Chain. FREE Personalization is included! Personalize your Athletic Dept. Key Chain with any name. Our Personalized Key Chain measures 2¼" x 2¼" and is a 1/8" thick. Made of reinforced plastic and includes a key ring. Additional Info MyWalkGear.com has many great Childhood Cancer Awareness Apparel & Walk Gear for your Awareness Event needs. You May also like to show your support for the person you’re walking for with our Childhood Cancer Awareness Water Bottle and our Childhood Cancer Awareness Sweatshirt as well.